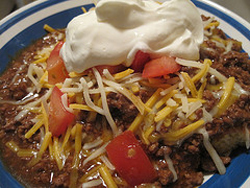 Variety of Delicious soul warming chili recipes. I remember these chili Recipes very well from a chili cook off at work. A basic chili which is quick and easy to make, a more complex chili and then a hot chili made with a can of beer and bursting with flavor. Don't be afraid of cooking with spices and herbs when making chili, add to the pot generously. 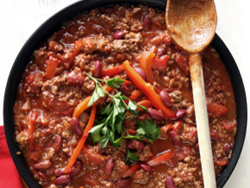 The longer you simmer chili the better it gets. Take note of my tips at the end. I personally have not made all of these chili's, but I have tasted them in the cook off so I know they are very good. In a large stockpot, cook beef with onions and celery until meat is cooked through. Add chili powder and Cajun seasoning. Cook until vegetables are tender. Add remaining ingredients, rinsing cans with a bit of water and adding the water to the pot. Heat through and serve. Garnish with cheese, onion and sour cream. Makes 5 quarts of Chili. Great dish to freeze for a quick and easy meal later on. Heat olive oil over low heat in a large heavy saucepan or Dutch oven. Add ground beef, stirring until it loses red color. Add onion, garlic, sweet pepper, bay leaf, oregano, chili powder, cumin, cayenne pepper, black pepper, paprika and chili pods. Saute for five minutes. Stir in flour, blending well. Add stock and bring to a boil. Reduce flame and simmer for one hour. Stir in sugar and cracker crumbs. Drain beans and add without their juice. Simmer ten minutes longer. Add salt if necessary and enjoy. Brown meat with onion, drain liquid and add all other ingredients and simmer for 2 hours. Serve with crackers, beer and cheese. I am sure you will have Miller beer in the house, but if not, I think you can use any brand of beer available. Before putting the whole cup of chili powder and the whole tsp of habanero pepper, divide it and add slowly to taste. These are pretty potent ingredients to add all at once.